With so many fanciful gowns from various centuries lingering in my closet, 20th century items just feel like normal clothes now. Sure, I wear my share of skinny jeans, Target t-shirts, and hoodies, but when I want to look "put together," I always go for something vintage inspired, and usually separates at that. It's so easy to throw a quick outfit together with those few key pieces. One of my key pieces is a 1930s navy blue wool gabardine skirt. It transitions between seasons perfectly, and despite people thinking I look like a granny, I feel elegant wearing it. 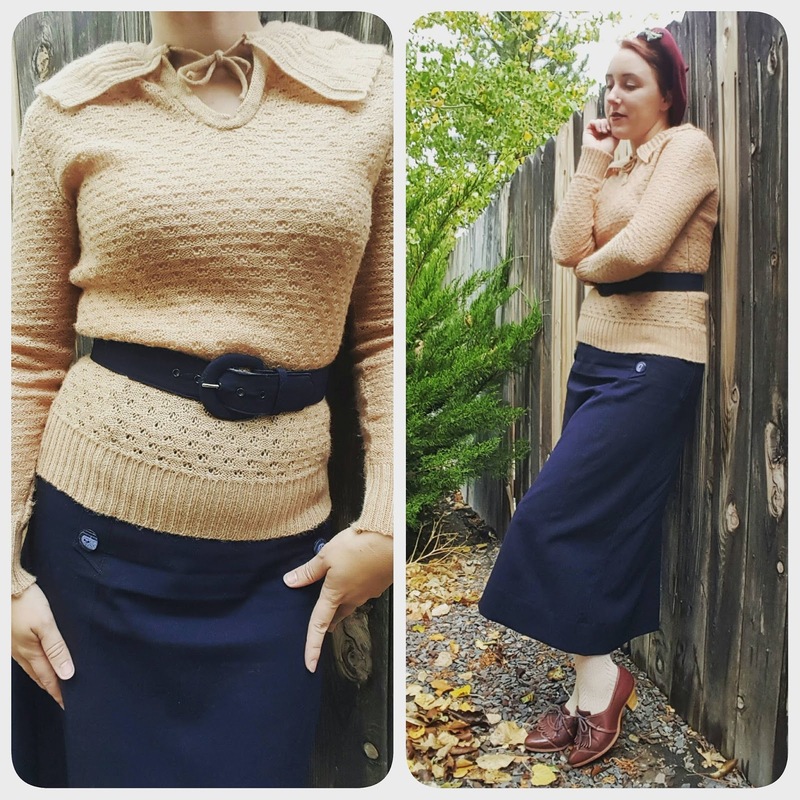 This past weekend it rained and was chilly, so I paired the 1930s skirt with knit tights, leather oxfords, wool beret, and a new '30s style sweater, belted at the waist. 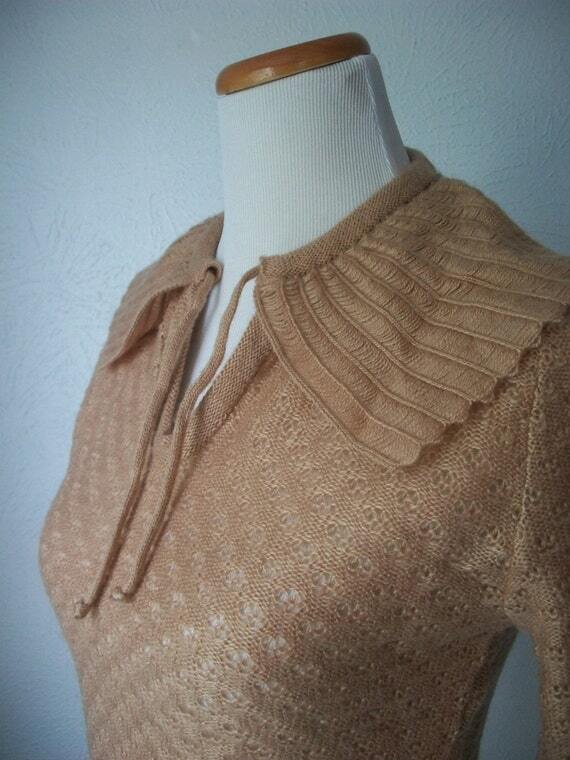 The sweater is actually from the '70s, another time when an interest in early 20th century fashion was popular. Despite the sweater being 100% "PolyAcryl" (we don't even use that term today! ), it's comfortable to wear, easy to care for, and definitely looks the part. 1970s-does-30s sweater detail. That collar! Sweater was from KatadrianVintage on Etsy. I know what you mean about "looking like a granny". I like to wear 40s and 50s inspired outfits day to day and when I was teaching I used to get lots of comments along these lines. I have to say I was fairly impressed by the girls who had enough knowledge to make air raid siren noises since the more usual question was "Miss, why do you dress like a Victorian?". I got tired of explaining that I do dress like a Victorian sometimes but not at school and wished that the history department would include some fashion history in their syllabus to save me the trouble! But I agree with you - I think it looks great and it certainly feels great. And personally, I'd be quite happy to look the way my Grandma did when she was my age! Congratulations on your outfit by the way - a clever combination that really looks the part. I love this outfit and don't think it's Grannyish at all, in fact this is one of my most favourite styles from the 1930s, a beautifully cut skirt, a cute interesting jumper or blouse, a pair of Oxfords and a beret. It's a look I wear often. I adore that jumper and am on the hunt for something similar as most of mine have short or three-quarter length sleeves which it's getting far too cold for. Don't you just love the drapey slim fit of the sweater? Really shows off your figure! I'd love to see it also with slim gabardine pants, or with the skirt and a neutral belt and dark tights. Great look! And I agree with the previous poster -- I would love to have my grandmas figures, esp her gams!!!! That sweater is too lovely!! All the colors go together so well, and I agree, you do need a small gun to complete the Bonnie look, haha! You look great. I don't have anything in my closet from the 20's or 30's and keep meaning to do something about it, but never quite get around to it. The collar on the sweater is amazing! Pft!! Who says you look like a Granny!!! They need to get their eyeballs checked....You look fabulous and I love that sweater so much! I cannot wait to complete my 1840s mourning ensemble so I can get started on my 1930s wardrobe!! This is another fabulous inspiration and this era lends itself more nicely to every day wear!! I've been loving reading your blog so much! I am such a fan of period dress and would love to be able to make some of my own someday. What advice would you give to an inexperienced sewer who wanted to learn costume making? Any particular sources you feel are essential? Hi Amanda - welcome to the wacky world of historical costuming. I started with Simplicity patterns and a lot of research (today we call that looking at pretty pictures on Pinterest, haha), but there are more and more independent pattern companies now with excellent repro patterns that work wonderfully and are designed by and for historical costumers. One I highly recommend is Wearing History Patterns - the Smooth Sailing pattern includes 1930s trousers, shorts, and a blouse, all of which go together easily with great instructions, very important for beginners. Wearing History also has Edwardian patterns. It's worth it to spring for the printed patterns instead of the ePatterns, to dial out the human error problem that can come up with taping all the ePattern pieces together. Another great independent pattern company that produces fabulous patterns with thorough instructions is Truly Victorian. This is a little deeper down the rabbit hole, because once you start in on attire before the 1920s, you'll need to do the underpinnings as well as the outer pieces of the ensemble. Truly Victorian has patterns and instructions for everything you'll need from corsets to bustles to skirts, aprons, and bodices. Their time periods start at the 1830s and go all the way through the early 1900s.